Nietzsche is a major figure in Western philosophy. His work is radical, sometimes violent, often ironic; it fascinates anyone bold enough to delve into it, exerted a profound influence on modern intellectual history, and covers a wide range of subjects. Nietzsche's writings border on the poetic; his aphorisms are particularly well-known for conveying all the radicality of his thinking in a intense but light, sometimes amusing manner. 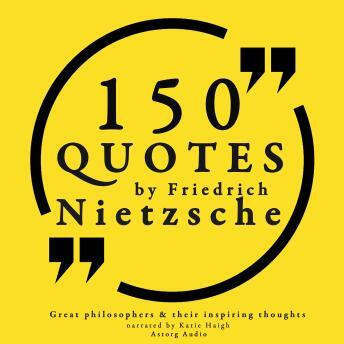 We have selected from you 100 of his most fascinating quotes, some of which have found their way into our daily expressions; enjoy the intensity of his writing, and dare to take a look into the abyss with this fascinating new audiobook.